It’s time to bring “Marketing Joy” to the masses! At Hasseman Marketing we pride ourselves in providing amazing promotional premiums to customers all over the United States. And frankly, we want to provide the right product to the person for the right situation. It’s NOT just about slinging SWAG. That’s why we help you ask the right questions (here are 5 you should ask before your next promotion). On the other hand, we want to be THE place you look for the best cool products for every occasion. We want to create “Brand-Slams” for you and your organization! (Here was the BrandSLAM from last week). 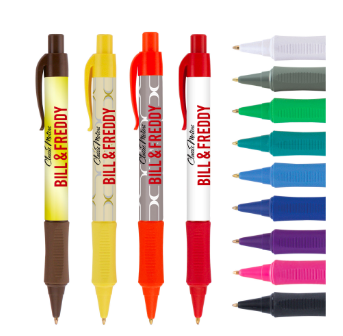 You might be asking yourself why we decided to focus on these pens this week on the BrandSLAM! We are glad you asked! But buckle up…because there are quite a few reasons…and they are all about ease. First, these are easy because of the pricing. The pricing on these awesome Vision Bright Pens is simple. One price. You get a full color imprint (full wrap) with no setups! Oh…and did we mention Free Shipping too? So, no setups and no shipping on these Vision Bright Pens! Easy. Second, did we mention full color? We love the idea that you don’t have to worry about additional color charges. Just send us your imaging (or we can help you with it) and we have a great full color image on these! Finally, let’s talk about ease of writing! The ever smooth ink is a hybrid between ball point and gel, so it writes so easy…and does not smudge. Lots of great reasons for this to be a BrandSLAM! For more information on this item you can click on this link. But if you want to discuss options or how this fits in with your other promotional campaigns, feel free to reach out to your HMC representative. Don’t have one? Email us here and can hook you up! To make sure you stay on top of all of our content (including the next Brand Slam) make sure to sign up for our VIP newsletter here.